This is an opportunity to use the same platform as StackOverflow (StackExchange), to give content authors, programmers, consultants, and content management offices (the business) an open community for questions, answers, and best practices. My colleagues and external peers (see the list) are dying to answer the propsed questions, but can’t until we move this project forward. Login to vote or committ using a StackExchange, Google, Yahoo, or a FaceBook account. No single platform or software can replace a community; I see this fitting in with the existing ecosystem of blogs, TridionWorld, Twitter, and Linked-In. To see how it’ll work, we’ll have to participate first. Count me in. Edit: added an easy-to-click image with my referrer id. Want StackExchange Area 51 points? Go for it and share your own. 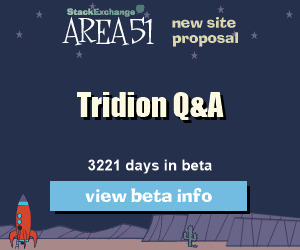 This entry was posted in Tridion 2011, Tridion news and tagged Area 51, SDL Tridion, Stack Exchange by Alvin Reyes. Bookmark the permalink. If you blog and want referral credit for spreading the word, after signing up click on the top-left “share” link. You can get a url or HTML snippet to use wherever.